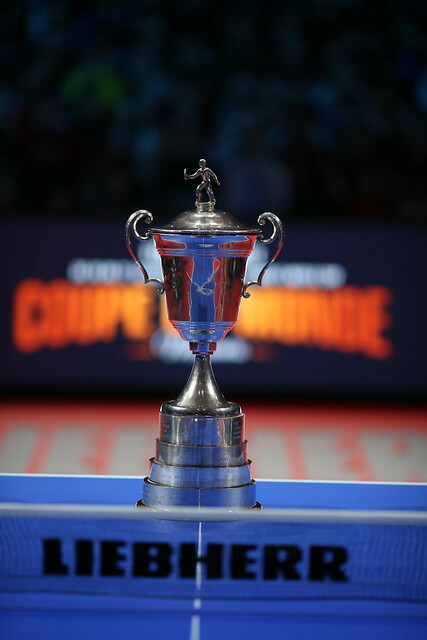 Spectators had already been treated to two fabulous days of world class table tennis action at Disneyland Paris, but it was Day Three in the French capital that held the most significance as the race to lift the Liebherr 2018 ITTF Men's World Cup drew to a thrilling conclusion on Sunday 21st October. Relive the excitement of the final day at Disneyland Paris with our Day Three review. Kicking-off the programme was an intriguing fixture between Germany’s Timo Boll and Dimitrij Ovtcharov, good friends off the table but at Disneyland Paris they would become rivals. Seeded one position above his opponent and gaining the upper hand earlier in the year when the two met at the 2018 Europe Top 16 Cup, you could have been forgiven for labelling Timo Boll as the slight favourite for the win but Dimitrij Ovtcharov was not to be underestimated, he was after all the defending champion. In an end-to-end affair with plenty of jaw-dropping moments, Timo Boll emerged successful across six games (12-14, 11-7, 15-13, 9-11, 13-11, 11-5) to reserve his place in the final. The second spot in the final was certain to be awarded to China, the only question was which player the honour would fall to as Fan Zhendong and Lin Gaoyuan met in the upper half of the draw. Leading up to the match Fan Zhendong had posted back-to-back straight game victories in Paris but Lin Gaoyuan would provide a tougher challenge for the top seed. Claiming the opening game in the match, however, Lin Gaoyuan squandered a total of five game point opportunities across the following two games as Fan Zhendong moved 2-1 ahead. From that point onward, it was one-way traffic – victories in games four and five eventually saw Fan Zhendong over the line (10-12, 12-10, 14-12, 11-7, 11-6). With the penultimate fixtures completed the attention shifted to the first medal contest of the day as the two defeated semi-finalists Dimitrij Ovtcharov and Lin Gaoyuan fought it out for the third spot on the podium. In their sole previous meeting on the international stage at the Seamaster 2017 ITTF World Tour Grand Finals it was Dimitrij Ovtcharov who took the applause but on this occasion Lin Gaoyuan was the quicker and more ruthless of the two players, defeating the German by a 4-1 score-line (11-7, 11-9, 9-11, 11-4, 11-3) to claim his first medal at the event. The stage was set: Fan Zhendong vs Timo Boll, China vs Germany, former champion vs former champion but who would emerge victorious under the lights at the Disney Event Arena? Victorious against the German legend in all three of their previous encounters but Fan Zhendong was pushed hard in the early stages of the final, edging to an opening game win by just a two-point margin. Following a tense start to the match Fan Zhendong appeared more composed in games two and three, pulling out a commanding 3-0 lead. Understandably the home fans were hoping to see a European winner crowned and Timo Boll responded in game four to reduce the deficit but ultimately the gap proved too big to overcome as Fan Zhendong made certain of the win at the first match point opportunity (11-9, 11-5, 11-6, 9-11, 11-8). Champion in 2016, no appearance in 2017 but in 2018 it was Fan Zhendong who returned to World Cup glory.